Because the Navajo Zoo had its beginnings with the acquisition of a single orphan Black Bear, the Bear became the overriding symbol for the Zoo. Thus, the Bear has been incorporated into the Zoo’s Logos since its beginning; however, the official logo has undergone two changes since the original version. 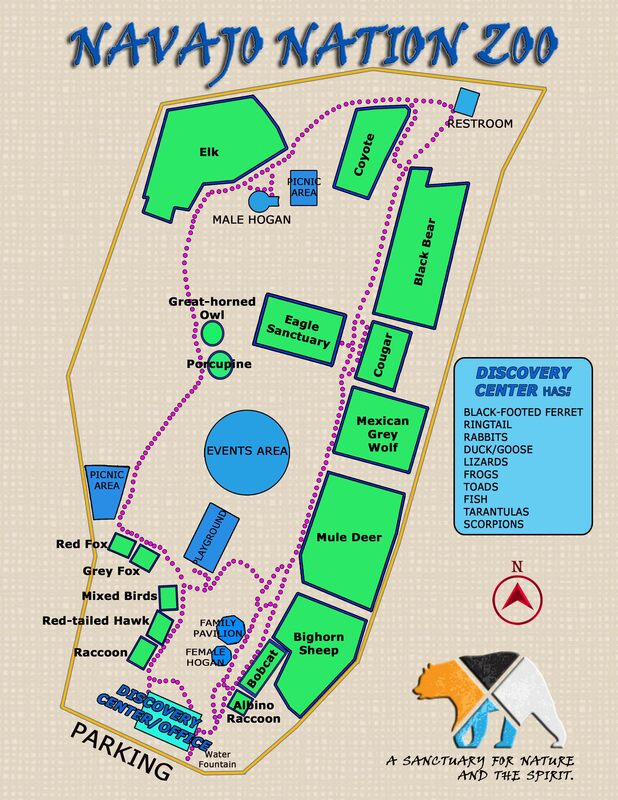 The original Zoo Logo was composed of a line-drawn Black Bear surrounded by a ring of silver stars, and the words “Navajo Nation Zoo & Botanic Park”. Then in the late 1990s, the Logo became a more detailed drawing of the bear face, above a single leaf that represents the botanical part of the Zoo. This Logo was drawn by the Navajo Nation Parks and Recreation Department and used while the Zoo was within that Department. In 2011, while under the Department of Fish and Wildlife, a new Logo design was donated by a graphic designer and friend of the Zoo. This design, developed by Mr. Norman Mallard, stays true to the standard by incorporating the Black Bear. This new design kept the tradition of the Black Bear, but also worked in the four colors important to the Navajo People; these are the same colors in the Navajo Nation Flag. The Bear is bisected with an ‘X” to represent the four Directions (north, south, east and west), four Colors, and the Four Sacred Mountains of the Navajo People. White for White Shell Mtn., the Eastern Sacred Mountain (Blanca Peak in S.Colorado). Turquoise for the Blessed Stone or Turquoise Mtn., the Southern Sacred Mountain (Mount Taylor near Grants, NM). Yellow for Yellow Shell or Abalone Shell Mtn., the Western Sacred Mountain (San Francisco Peaks near Flagstaff, AZ). This new Logo was officially adopted by the Zoo Staff on November 1st, 2011.